Kevin Chang’s yanagi slide-slices through the fish’s flesh, its blade gliding through geological layers of fat and muscle so alive they’re still swimming. The knife shepherds the sashimi to the side; then Chang lifts it with metal chopsticks to array it on the tray. If he touches it with his hands the warmth from his fingers might change the temperature of the fish and thus its texture and flavor. Sashimi is raw fish, unadorned, the tuna deep pink and buttery; the flounder white, thin-cut and chewy; the salmon orange and marbled with fat; the yellowtail a delicate pink and mild; the octopus white and ridged with the stubs of suckers, resistant to the teeth. Between are mountains of grated dalkon radish topped with parsley; the rectangular glass plate has ruby edges. Chang’s eyes crinkle as his customers admire. Then his hands are back in motion, sliding open the cooler case, pulling out a slab of pink flesh or white, marbled or suckered or smooth. He closes the case, hand always stopping the door and bringing it to a gentle rest. Each movement is efficient, each recognizes the delicacy of the flesh in front of him. The knife slides, heel to tip; it does not jiggle or jerk or saw. Chang builds his tray of mountain, valley and stream, something peaked, something low, the plate itself the stream, so that the patron’s eye travels a landscape. The meal here at his restaurant is slow, orchestrated for color and taste. First the sashimi, then the nigiri, then the rolls. Mild first, spicier later. Chang slices a piece from a flounder belly fillet, turns it three times with the tips of his fingers, looking for the line of the muscle just as you might with a cut of beef. His knife slides, then he sets it down gently and claps once with cupped palms, knocking off any moisture that might make the rice disintegrate. “We tell customers we are applauding ourselves,” he says. With one hand he scoops from the steamer of rice, 12 cups for every shift, and forms a ball that holds together just enough to stay intact from tray to mouth and then to collapse, releasing flavor onto the tongue. In the beginning he practiced as he drove, as he watched TV, squeezing rice into mouthfuls, training his muscles to make each one just so. Now, after 20 years, he can customize, a tighter one for the client who clenches with his chopsticks, a looser one for the woman who holds hers as if each bite were glass. Sushi rice is not sticky rice but short-grain, seasoned here at Zushi with a touch of sugar and salt. It will never be fluffy like the long-grain that Americans tend to eat at home. In Korea and Japan it is eaten with every meal. “It is our bread,” Chang says. With his right hand he squeezes another rice ball, his eyes roving over his customers. With his left he drapes the piece of white fish over the rice, then with his metal chopsticks he crosses it with the thinnest line of scallion before lowering it to the getta in front of the customer. This piece of nigiri is topped, so the educated customer knows not to dip it in sauce. The chef has made this bite specifically for her, knowing what she ate last time, what she lingered over, what made her savor. He gives his smallest version of a smile as she chews, her cheeks stuffed like a chipmunk’s and her eyes closed in pleasure. Next for her he chooses a rectangular tray and lays out four perfect pieces of tuna. With a blowtorch he sears them until the tops are barely browned. To that he adds olive oil, a touch of the citrus soy sauce called ponzu, a teaspoon of capers, and slivers of red onion and oba shiso, a minty herb. He rings a bell and a waiter moves the tray from Chang to the customer. This is ceremony, ritual, performance art. 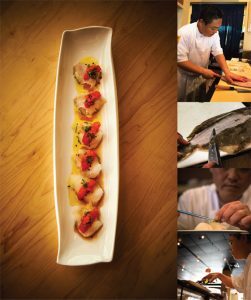 Chang, chef-owner of Zushi – in Virginia Beach’s Town Center – trained under the master chef Sota, head chef of Nakimoto’s in Texas, a perfectionist in the oldest traditions of the art. As with the biblical story that to truly serve you must first wash feet, so to be a sushi master you must first wash dishes. “You must know how to care for that plate,” Chang says. “My teacher would tell us ‘The plate is your canvas’ and in the traditional way the canvas must be clean. You can’t just scrub it. You soak it and you wipe it gently. to help his co-workers. He saw his small, quick hands and he chose him to handle the fish. Sota’s restaurant was in Plano, right outside Dallas. No water, no fish anywhere. So every day Chang or a co-worker would drive to the Dallas-Fort Worth airport to wait. They would talk about the fish, they would talk about their customers. When he’d get back to the restaurant and open the box everyone would crowd in, excited. He still gets that feeling today. He learned to store the fish as it swims – upright for the ones that swim upright, on their back for fish like flounder so that the belly fillets don’t bruise. He learned to use tweezers to pick out bones, to scale gently and to use his debba to skin the delicate flounder. He learned to make sure the sushi graders had slit behind the gill and above the tail to drain the blood that would make the fish unfit for sushi, and to reject fish with the bruises some get when they’re dragged in a net or allowed to flop around in the bottom of a boat. He learned to gauge freshness by pressing on the flesh with a finger. Finally he learned to slide his knife, its blade flat on one side and beveled on the other, smoothly, heel-to-tip through the meat, each slice just thin or thick enough. “The Japanese make it very easy,” he says. The knife is single-edged. Used properly it is like a slicer at the deli counter, the angle of the chef’s hand determining the thickness of the cut. Do it right and the fish believes it’s still alive. Saw at it and the fish you leave behind flakes apart and too soon is relegated to the kitchen. But even Chang’s cooked fish is sushi-quality. It took two years of long, painstaking days before Sota said, “It is time for you to make tamago,” the custardlike egg roll that is a test of a sushi chef’s touch and patience. It is made in a square pan over a burner; make a layer, push it back, add a layer, push it back. Layer after layer after layer. “When they teach you this they’re saying you’re ready to go now,” Chang says. To New York and New Jersey, Massachusetts and Puerto Rico and Florida, and finally to Virginia Beach, where he was opening chef for Sumo Japanese Steak House and Sushi Bar. In 1999 he bought the Nara Sushi Restaurant and in 2005 he sold his share in that and opened Zushi. Hello!” he says, as a customer walks through the door. “Welcome.” In front of him are six chairs for six patrons for whom he will create an arc of flavors and textures, the plates spotless and carefully selected, a higher edge for nigiri with sauce, a broader one for fish that needs a frame. Dots of ponzu or teriyaki or soy sauce and morsels of pickled onion or minty basil are chosen for each cut, each palate. He memorizes what people eat, where they linger, whether they’re kosher or gluten intolerant, what makes them moan or exclaim. He wipes, wipes, wipes a plate. He is a sushi bartender, constantly watching his clients to see if they need more wasabi, more ginger. He speaks in Japanese, and in moments the waiter brings fresh tea or a cool glass of wine. He speaks again – “Oh-ah-ee-so” – and the bill appears. In the mornings, Chang opens his cooler case and says, “Morning, ladies.” His eyes sweep over each fish. He presses one to see if it is still alive. Chang gets the thrill of new shipments every three days, most from the Japanese distributor True World Seafood, which has been selecting fish for him for 20 years, but now some of his best whitefish comes from George Georgiades at George’s Seafood in Norfolk. As with all art or craft, the tools matter, and they’re expensive. Knives run from $200 to $15,000. The yanagi Chang uses was a gift from his wife, made for him by a knifemaker in Japan and inscribed with both Chang’s name and that of the artisan. In the kitchen he has an 800-grit stone for shaping, a 1,200- for sharpening, and a 2,000-grit, almost as smooth as leather, for making the knife shine. It’s the 2,000 he uses each morning, honing his knife, examining his fish. At the bar, his eyes sweep over his six customers. A woman in front of him is slowing down, clearly nearly done, and his hands move once again, cutting a piece of smoked freshwater eel – boneless as Americans prefer – and draping it over the rice. He gives it the thinnest brush of teriyaki – vegetarian because he doesn’t mix flesh from land and sea – and places it on the getta. The bite is warm and sweet and buttery, a blend of fish and rice and sauce. It melts and explodes in the mouth. He knows this. He gives his customer a moment of silence as she savors, eyes closed, eyebrows high, head sweeping side to side. When she is still he gives the slightest of nods and his hands move again, slicing off just a bite of his signature tamago and placing it on the getta, its sweet, eggy taste the gentle finale to Chang’s symphony of tastes. Nigiri – fish over rice, what most think of as sushi. Sashimi – raw fish of any kind. Futo maki – big, picnic food roll with fish and vegetables and sometimes tamago. Tamago – custardlike egg roll. Getta – the wooden tray that looks like a samurai’s sandal. The sushi chef places it in front of you and then places pieces of nigiri on it, one at a time, pacing the arc of your meal. The etiquette of sushi dining is delicate, even ceremonial, a dance between the authority and expertise of the sushi chef and the tastes of his diners. Don’t dunk the rice side of a piece of nigiri into soy sauce. The rice acts like a sponge, soaking up so much sauce that you lose the flavor of the fish. Do turn it over and touch the fish into the sauce. Don’t dunk any nigiri that has a topping; the chef has created that blend of flavors and textures for you. Don’t take the getta (tray) off the counter and thus out of the chef’s reach; take only the sushi. The chef is watching what you need and providing the next taste. Consider him a sushi bartender. Do pick up nigiri with your fingers, rather than with chopsticks. Do eat ginger between courses to clear your palate. Don’t bite nigiri or rolls. It doesn’t matter if you look like a chipmunk as you chew; the chef has crafted the perfect mouthful for you, right down to the size of the bite. Do slow down. Savor the texture of the rice, the saltiness of the fish, the tang of the toppings. Do sit at the bar. Come back. Sit with the same chef. Let him learn and lead your palate. 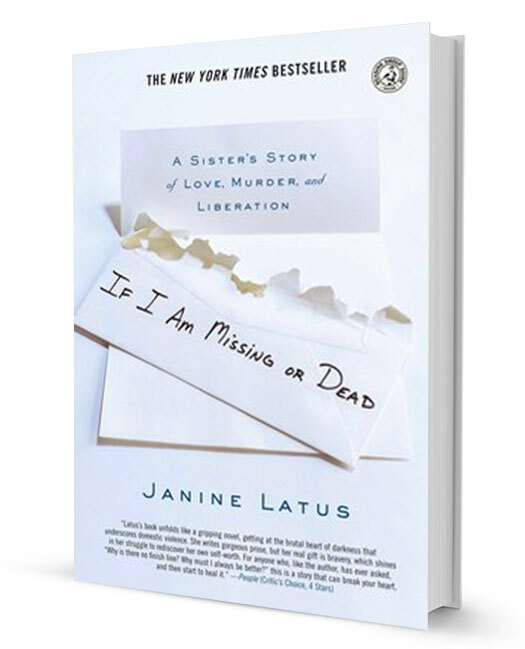 If I Am Missing or Dead is a heart-wrenching journey of discovery as Janine Latus traces the roots of her own — and her sister’s — victimization with unflinching candor. This beautifully written memoir will move readers from the first to the last page. At once a confession, a call to break the cycle of abuse, and a deeply felt love letter to her baby sister, Amy Lynne Latus, If I Am Missing or Dead is an unforgettable read.